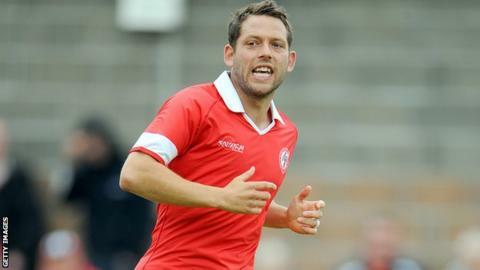 Leam Richardson wants to become the permanent manager of Accrington. "We'll get this game out of the way and we'll weigh up our options," Richardson told BBC Radio Lancashire. "The opportunity's fantastic. I've been here a long time. I hold it high in my ambitions to be manager of Accrington. We'll see what comes of it." Speaking to the Lancashire Telegraph, Accrington's managing director Rob Heys has said Richardson will be given first refusal on the manager's position. However, it is also thought that Cook would like Richardson to follow him to Chesterfield. Richardson served as assistant manager during Cook's nine-month reign at Accrington, which came to an end on Thursday when the former Wolves and Coventry midfielder left to become manager of the Spireites. "Not for one minute did I think I'd be in the same situation, but hopefully that's given me experience and something to learn from," said Richardson, who joined Stanley as a player in 2005. "I've definitely learned a lot from Paul over the last nine months. We wish him well. "It's a big loss for Accrington but a great gain for Chesterfield." He added: "We're all professional. When things like this happen, you're quickly conscious that there's a game in a couple of days. "You want to prepare for that as well as you can. I've had a chat with the lads and made that quite clear. "The main focus is on Bristol Rovers, because they're not bothered if there's a manager in place. "They're coming up to win a football game and we've got to meet that head on." Accrington could give a debut to new signing Osayamen Osawe on Saturday, after finalising his month-long loan switch from Blackburn.